The 19th century saw a flowering of interest in history, encouraged by the publication in 1814 of the first of many historical novels by Sir Walter Scott. These fictions were woven around such notable characters as Queen Elizabeth I, and set in carefully researched historical locations. 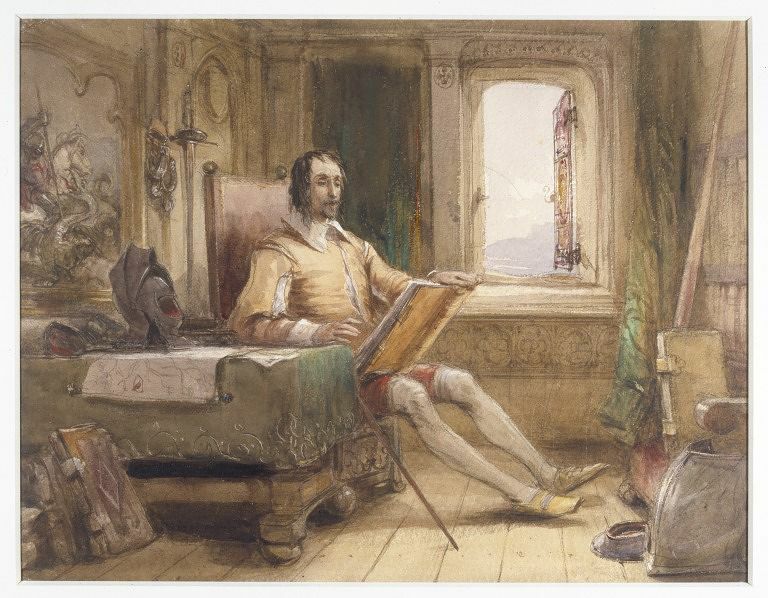 The past became the playground of artists, and Charles Cattermole's picture of 'Charles I and his secretary' is typical of such imaginative recreations of British history. The imagination and invention of artists was also endlessly fed by British writers. Eve of St Agnes by Sir John Everett Millais, is taken from Keats' evocative poem of the same name. It is a beautiful example of a work inspired by literature rather than being straight-forwardly illustrative. The works of Charles Dickens were particularly popular subjects of Victorian literary painting. Cattermole's The Grave of Little Nell' exemplifies the Victorian sentimental fascination with the tragedy of Little Nell told in 'The Old Curiosity Shop'. Perhaps surprisingly Miguel de Cervantes' novel Don Quixote was also popular with Victorian audiences. Written between 1605-15, it was the story of an adventurous Spanish knight and his squire. Charles Green started painting illustrations for publishers. 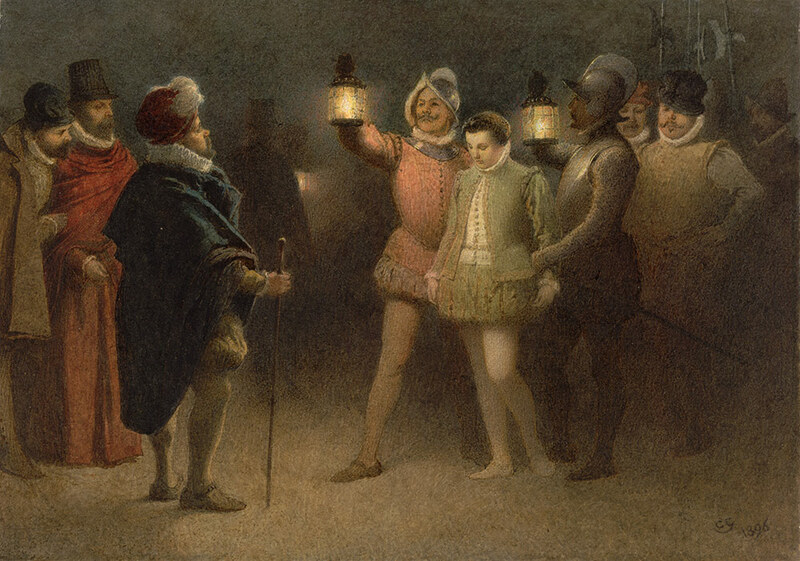 But 'Sancho Panza, Governor of Barataria, going the Round with the Night Watch', shows us the amazingly delicate technique which won him his reputation as an independent watercolour artist. 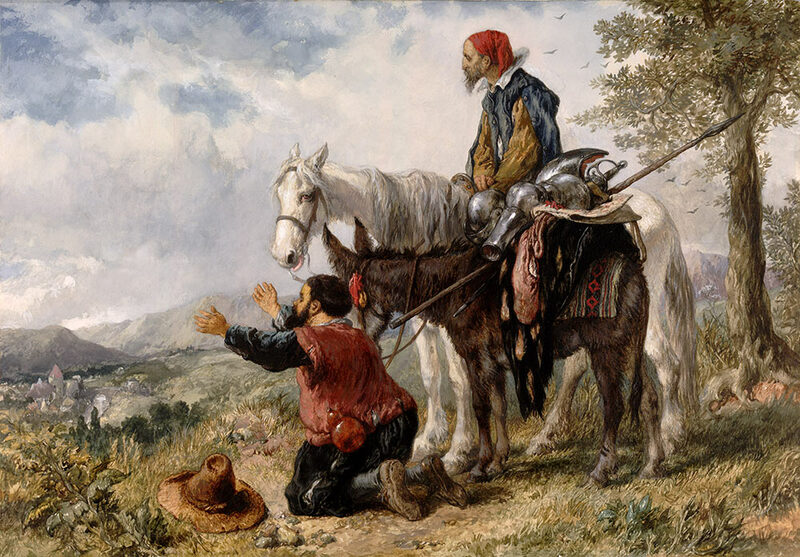 In contrast, the focus of Sir John Gilbert's 'Don Quixote and Sancho Panza returning to their Village' is the authentic representation of costume and accessories. Early in his career Gilbert filled sketch books with studies of the Royal Horse Artillery and the hallmark of his work was an eye for the detail of uniform, armour, military equipment and horses. Such watercolours assumed a literate audience and were encouraged by the popularity of the new 'Annuals' (illustrated magazines). It was said of Gilbert that, 'a narrative read, he at once knows how best a picture can be made. His fertility of pictorial invention is inexhaustible'. Bibliographic References Victoria and Albert Museum Charles Dickens: An exhibition to celebrate the centenary of his death London: HMSO, 1970. P.3. Catalogue of the exhibition held at the Victoria and Albert Museum, June-September 1970. As soon as the first new numbers of the Pickwick Papers had been published a comparison was drawn between Mr Pickwick and Sam Weller on the one hand, and Don Quixote and Sancho Panza on the other."